Single-incision surgery is an evolution of conventional laparoscopy. It reduces not only the invasiveness of the access but also the surgical procedure itself. Although SALS for colorectal resection was initially performed only for benign diseases, there is now an increasing adoption for malignancy, which raises questions concerning oncological adequacy. However, this approach is not yet used routinely for the treatment of benign and malignant colorectal disease, because clear advantages for the patient are still lacking. 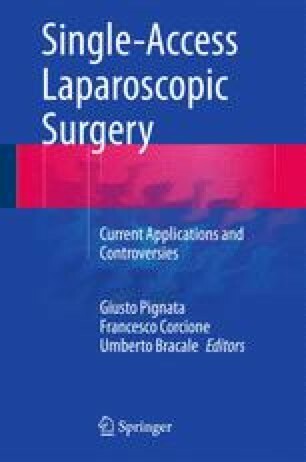 We report our standardized technique as well as the case series in the use of a single-access laparoscopic approach for the treatment of left colon disease.